Adding correct page titles and descriptions are beneficial as it can improve your website visibility in search engines such as Google. Think of your websites title as a label for describing the content of the site to your potential guest. Not only is it the title in your browsers window but also it appears as a header in the search results. Therefore, it's a very important part of your sites SEO (search engine optimization) structure. When choosing a title either for your website or just for a page, try to keep it around 55 characters max. Thats about the average length for the title not to be shortened in the Google search engine. Title simply states the name of your page in the websites menu. You should choose a title with the intention to give your guest an idea of what that page is about. For example, if you have a store set up at your website, name it 'Shop'. We suggest keeping the titles as short as possible because long menu tabs might become unreadable. From the SEO standpoint, titles are important as they are displayed as headers for your pages description in the search engine, as well as they are displayed in your websites site map. The different types of titles on your Voog page. It's important to think about the structure of your websites title in the way how it's displayed in the search results. If possible, always add a primary keyword or your company's slogan next to the actual name of your website. This helps to catch the browsers eye in the search results list. Make sure that the primary keyword isn't included in a long sentence and the slogan itself is as self-explanatory as possible. The page title should be short , labelling the current pages content. Unlike the webpages title, it shouldn't contain any further elements such as a slogan of your company. On the other hand, for example, if you have an e-store and you name your store menu label "Sale", statistics show that it attracts more visits than just "Store". Therefore, it's still very important to think through how you name your menu items. Open the 'Content > Structure' menu and you will see all of the languages on your site listed. Select one of them and refer to the 'Website title' field to add or change the site name. Please refer to the "Changing page titles and descriptions" chapter in the Managing your website pages menu. Description is an informational text that accompanies your website in the search engines and social sites. With about 150-160 characters, it should give an overlook on the main idea or focus of your website. Also, it should be understandable for a guest who doesn't know specific content-related terminology. When you've connected your Voog site with Google Webmaster Tools, it should begin appearing in the Googles search results. The information next to your websites name in the search engine should be displayed like this - the name, the URL and the description of your websites front page. This means, that a description represents your site and gives its potential guest a short overlook on what it's all about. Please note that especially important is the description of your sites front page because this will be also added to the search results. Additionally, social sharing sites such as Facebook also display the description along with the shared content from an outer source. Therefore, adding a description is absolutely necessary and if it is set up the right way, it will play its part in gaining your website more traffic. How do I add a description for a page? 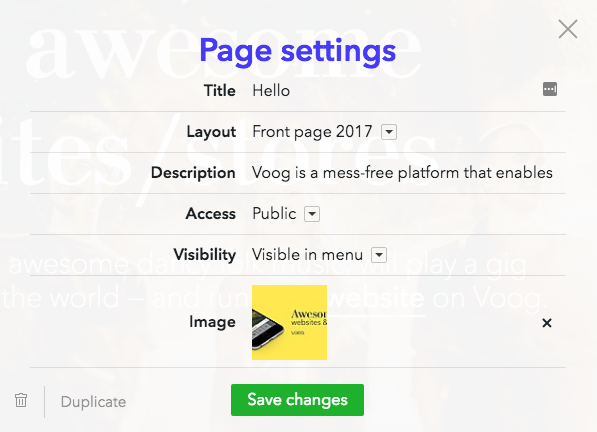 To learn how to add a description for the pages on your Voog website, please take a look at "Changing page titles & descriptions" guide.